Chlorine dioxide gas (CD) is the most effective method of decontamination available. It has been used in the food industry for many years for the decontamination of facilities, tanks, rooms, laboratories, piping systems, duct work, spiral freezers, cargo trailers, tented pieces of equipment, and so much more. Below are a couple examples of projects ClorDiSys completed in protein powder facilities. This 300,000 cubic feet facility consisted of a small packaging room, a mixing room, and a dryer room. The dryer room was 70 feet in height and consisted of various processing equipment with access platforms. Even after thorough cleaning and liquid decontamination, a persistent salmonella problem could not be eradicated. ClorDiSys was able to fumigate the facility utilizing gaseous chlorine dioxide and eliminate the organisms while providing sporicidal kill of Biological Indicators (BI) placed throughout the facility. This seven room, 200,000 cubic feet facility consisted of packaging rooms, grinding room, mixing room, and a dryer room. The rooms consisted of various processing equipment. There was also an adjacent control room and office area that were also decontaminated to ensure a thorough treatment. 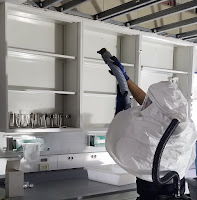 ClorDiSys was able to fumigate the facility utilizing gaseous chlorine dioxide and eliminate the organisms while providing sporicidal kill of Biological Indicators (BI) placed throughout the facility. The decontamination cycle employed by ClorDiSys involves many checks and safety factors to ensure that a thorough level of kill took place. Biological Indicators, also known as BIs or spore strips, are used as a test of the process efficacy. The BIs used by ClorDiSys consist of a paper substrate impregnated with more than a million bacterial spores wrapped within Tyvek, because this particular organism is known to be of high resistance. BIs are placed within the area being decontaminated, usually in hard-to-reach areas or hot spots, to confirm the decontamination’s success. You can read more case studies from a variety of industries in our Decontamination Services brochure.